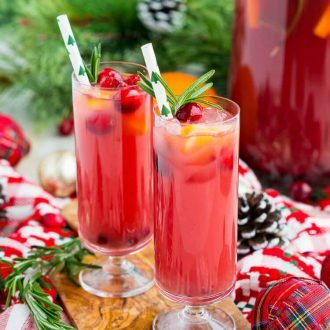 Christmas Punch is an easy and delicious holiday party drink packed with fruits like cranberries, oranges, and pomegranates. 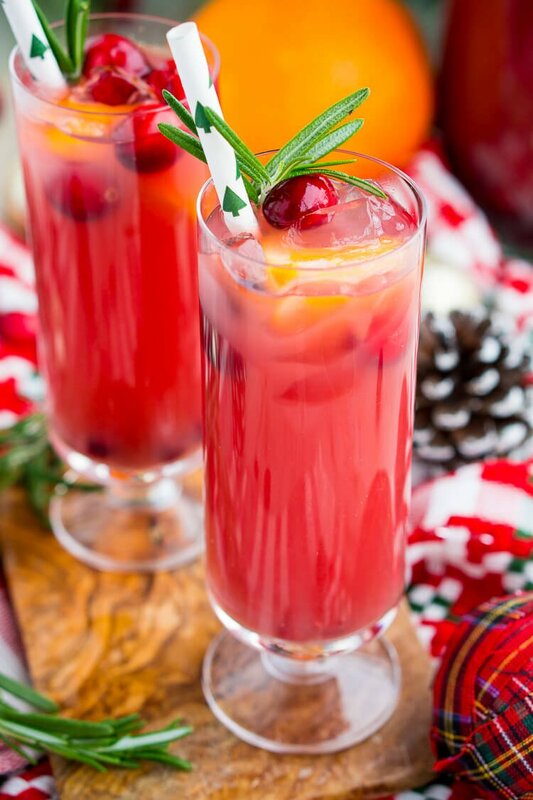 Keep it non-alcoholic or add rum or vodka for extra holiday spirit! 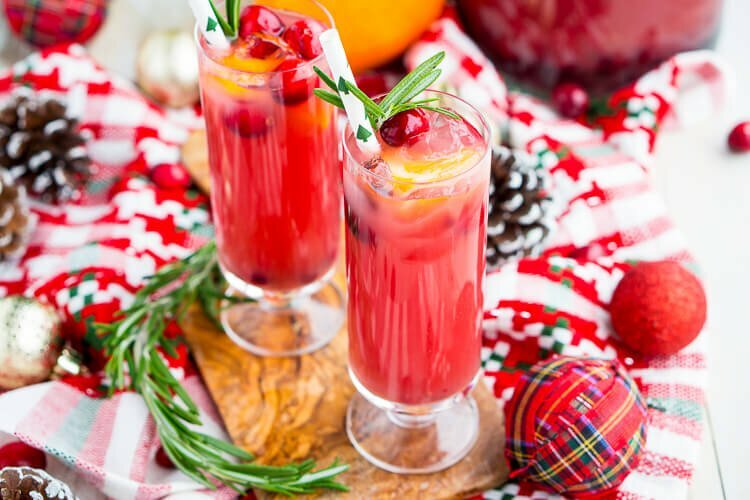 Christmas Punch is an absolute must for the holiday season! You would think that by working from home, I’d have control over my own schedule and I’d take advantage of that fact by scheduling myself off for the whole month of December or something to enjoy the holidays. But the problem is that I DO have control over my schedule, but once a procrastinator, always a procrastinator… and since my boss (me) is a procrastinator too, I always end up scrambling. And let me tell ya, at this point, I could really use a pitcher of this Christmas Punch. 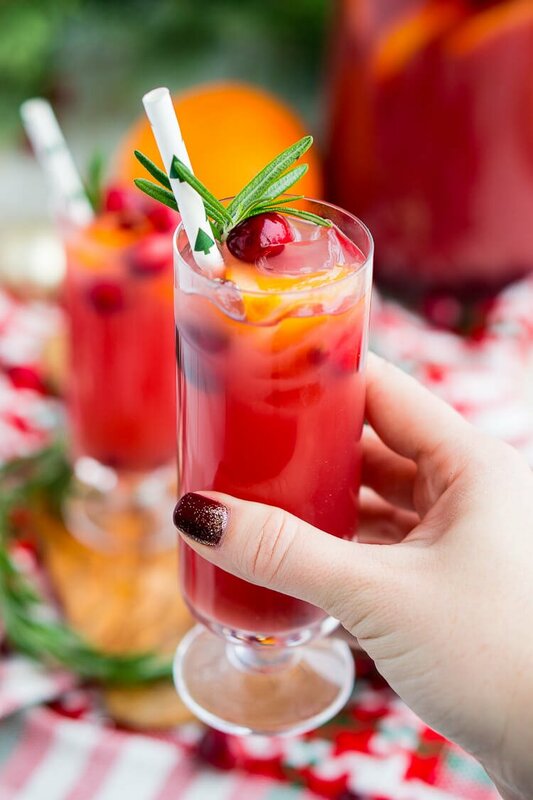 And if you’re not a procrastinator and you’re really planning ahead, check out my Thanksgiving Punch recipe too! JUST TAKE ME TO THE CHRISTMAS PUNCH RECIPE ALREADY! 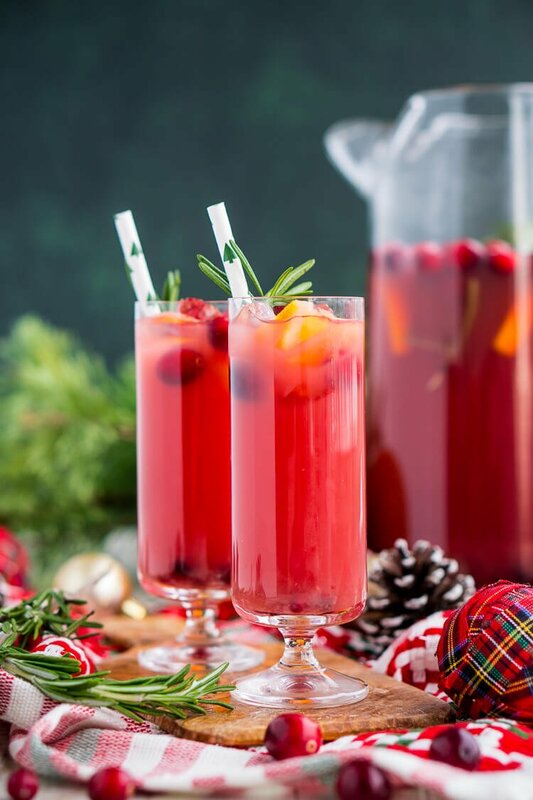 If you’d rather skip my (very helpful, I think) tips and tricks, essential cooking info, and similar recipe ideas – and get straight to this deliciously easy Best Ever CHRISTMAS PUNCH Recipe – simply scroll to the bottom of the page where you can find the printable recipe card. The truth is, I haven’t even put up a tree yet or a single light or decoration, and I probably won’t. I bought new stockings last weekend at L.L. Bean, and that is pretty much the extent of it, and Christmas is ten days away. I’m really not being a Grinch, I promise! Christmas is my favorite holiday! But when I think about all the work setting up and taking down when we won’t even be home on Christmas Eve or Christmas, it just makes me exhausted. Once we have kids, that will be a different story, but for now, let’s drink some Christmas Punch, okay? When I was growing up, the Christmas menu was always changing, some years it was turkey, some it was ham, some it was lamb, and the occasional pizza, and these days it’s usually all of the above because my family is filled with picky eaters. But even when the food was getting changed up, my mom always made a Christmas Punch. Sure, that too changed over the years, but regardless of the ingredients, there was always punch. Oh, and there were always meatballs too because wars would have broken out if those weren’t there! 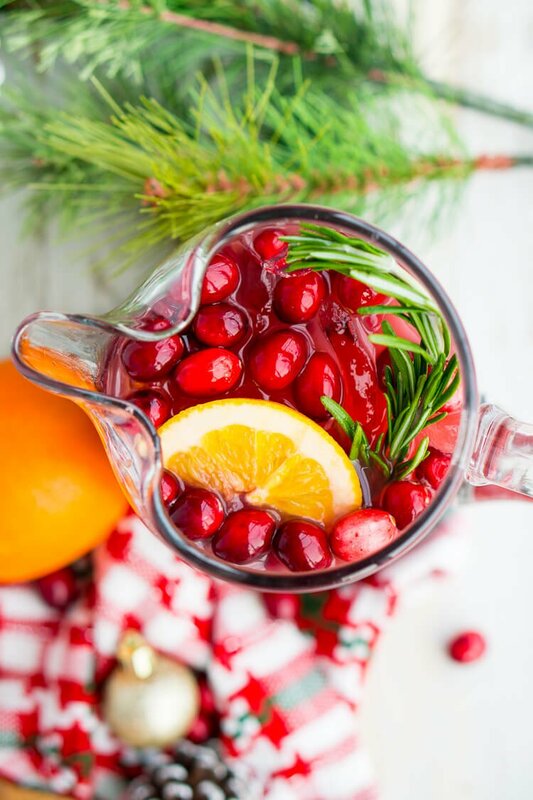 How To Make Christmas Punch! My mom always used the same base: cranberry juice, orange juice, and ginger ale. But I think my interpretation really embodies all that my mom’s punch is to me and all that I am too. So I’ve added pomegranate juice to the mix and swapped the ginger ale for lemon-lime soda, I prefer Sierra Mist. 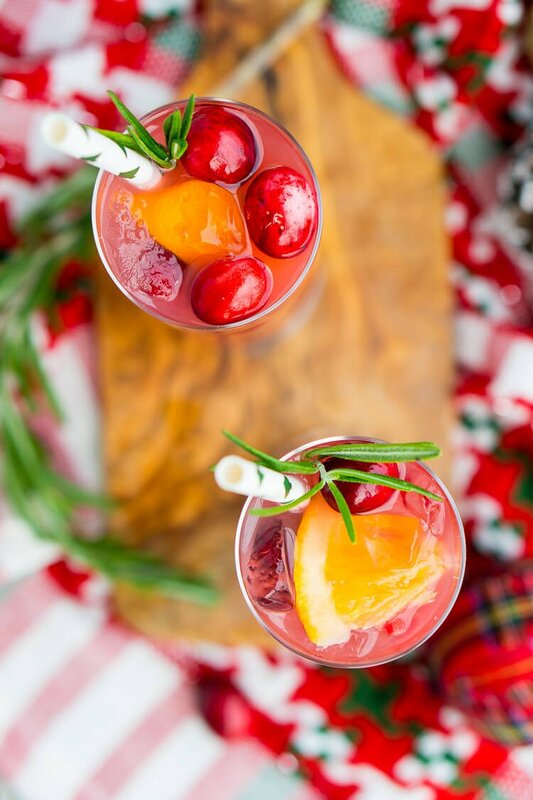 Add pomegranate seeds and a sprig or two of rosemary (for sophistication, of course), oh and some extra holiday spirit by way of rum or vodka and you’re in for a truly festive holiday punch. Don’t forget the orange slices and cranberries too! Simply leave out the alcohol and add some addition lemon-lime soda. It will still taste amazing and this way the whole family can enjoy it! My family likes to leave the bottles of vodka and rum next to the punch bowl so that we can make individual cups of the punch alcoholic really easily if we want to. If you’re spending the holidays away from home, you should still make a big batch of this punch. Much like sangria, punch flavors get better with time, so by day three of sitting in the fridge and stealing glasses each night, those last few cups should be pretty awesome! I just love how easy punches are to make, they require less technique than a crafted cocktail, but they’ll still impress a room full of guests and are super tasty. Tools you might need for this punch! 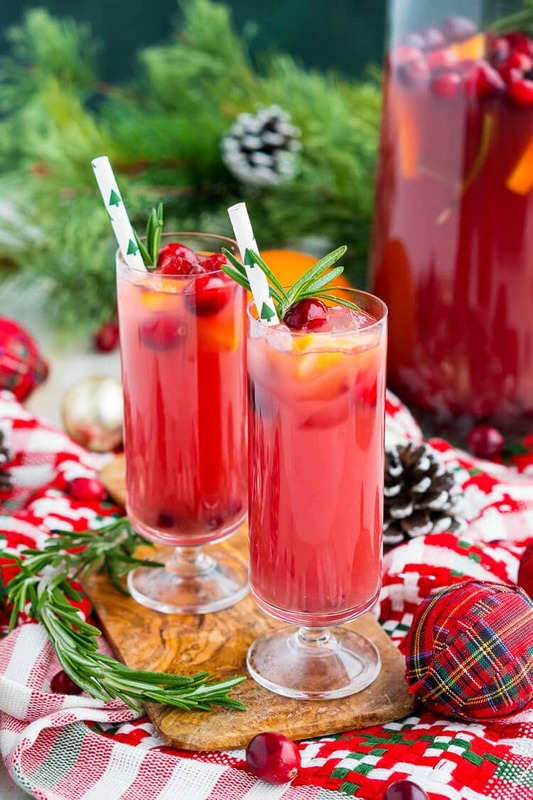 Watch How To Make Christmas Punch Below! Combine all ingredients in a large pitcher or punch bowl over ice. If using a really large punch bowl, you can double the recipe. This punch can be made ahead of time, but don't add the ice or soda until just before serving so as not to dilute or lose its fizz. You can sub the lemon-lime soda for ginger ale. You can add lemon and limes slices as well. Keep alcohol on the side for guests to add their own and keep the punch itself kid-friendly. I like white rum, spiced rum, whiskey, and vodka with this recipe. Love this drink. Made it for Christmas and it was gone in minutes!! I’ll be bookmarking this recipe. The only thing I changed was I used Cran-pomergranate that was premixed in the juice aisle. I’m so glad you all enjoyed it Keren! Happy Holidays! Hello I was wondering how much Ingredients I would need for 40 people and is rum or vodka better used in this? This recipe makes about 8 cups, so you’d likely want to quadruple the recipe and you can add extra soda or alcohol to make up the last few cups. I personally am not a big vodka fan and prefer rum in this recipe. Spiced rum tastes great in this recipe too! Looks wonderful! What type of cranberries did you use? I can only seem to find frozen, dried or canned ( with sauce but little whole cranberries) not sure which to use? I assume frozen but didn’t know if I should thaw or put in frozen??? Help!!! Thanks!!! Hi Emily, I usually use fresh, but they would likely be hard to find as we’re wrapping up the season. You can use the frozen one’s and they can be added frozen or thawed. Enjoy! Wondering if you have ever subbed out the ginger ale for champagne…. How much vodka do you put in each glass if you want to add after? Where did you get these cute punch glasses? I have looked and looked for them! Love them! Hi Bonnie, I got them at Tjmaxx years ago.